We are greatly honoured to have in our midst, His Excellency Yoweri Kaguta Museveni, President of The Republic of Uganda; and all the guests from inside and outside Buganda and Uganda to remember the storming of the Lubiri by Uganda Army troops on the morning of 24th May, 1966. Let me begin by once again congratulating President Museveni on his victory in the presidential elections which were concluded recently. Mr. President, may the Lord guide you as you steer the ship of state to greater peace, stability and development. Your Excellencies, ladies and gentlemen, I decided to remember the 24th May because it is of great significance to my family, Buganda and Uganda. The events of that fateful day changed our lives as a family and the lives of the Baganda and Ugandans in a fundamental way and many of us are still trying to come to terms with the changes the events of 24th May 1966 brought about. I thank the Lord for having enabled my father, the late Ssekabaka Mutesa II and some of his aides, for having successfully fought their way from the burning palace to safety. We should remember the clergy at Lubaga for the hospitality they offered my father at his greatest hour of need and for assisting him to escape to safety. I thank his loyal subjects who assisted him on his long march to freedom. I thank the British government who agreed to accept him as a refugee and all those who supported him and comforted him in the loneliness of his London exile. Let us remember all those who stood by him and fought by his side and died at the hands of the Uganda Army of which he was Commander-in-Chief; Let us remember all those who were imprisoned and tortured; Let us remember all those who lost their loved ones and those that had to live in constant fear of the authorities and those who were traumatised by the violence unleashed by the authorities. This is a very sad chapter in the history of our country but we cannot skip it, because there are lessons to be learned from it that can greatly contribute to the building of a peaceful and united Uganda. On that fateful day the Lubiri, embodiment of Kiganda culture and traditions and the very soul of Buganda went up in flames and brought to a halt almost 1000 years of history. For once in her long history Buganda was without a King. She became an ant-hill without the queen ant. We never lost hope that one day our cultural integrity as Baganda would be restored and we thank God that, that integrity which we craved and cherish was restored in 1993. 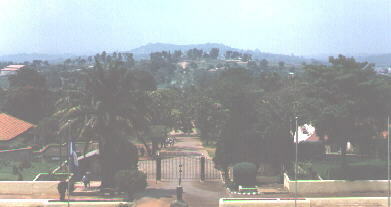 From Bulange, looking down Kabaka Anjagala Rd. The Baganda cannot continue to mourn indefinitely for what was lost. We should not continue to labour under the burden of self pity because this self pity will destroy our soul and, therefore, our resolve to rebuild Buganda. Let me in this connection draw the attention of our people to the book of Nehemiah in the Holy Bible for inspiration. In chapter 2 verses 17-18 and I quote "Then I said to them 'You see the trouble we are in, how Jerusalem lies in ruins with its gates burned. Come, let us build the wall of Jerusalem, that we may no longer suffer disgrace'. ....and they said 'Let us rise up and build'. So they strengthened their hands for the good work". Instead of lamenting the sorry state to which Jerusalem had been reduced and stopping there, the children of Israel rebuilt Jerusalem. I would like to tell the Baganda that 30 years of mourning are enough. Now is the time to begin rebuilding Buganda with our brains and hands. No greater tribute can be paid by us to the memory of those who suffered and died at the hands of tyrants than the rebuilding of Buganda in all respects. The place to begin the building of Buganda is the discipline of our youth. Buganda was built on discipline and I, therefore, charge parents and opinion leaders in Buganda to inculcate discipline amongst our youth. They are the ones who are going to build the New Buganda of our dreams and they must, therefore, have the discipline to do so. I ask all the leaders in this crusade to lead by example. That is the only way our youth will learn to lead disciplined lives. It is sweat and toil that makes countries prosperous. The Baganda must, therefore, sweat and toil to make the land of their ancestors a great place to live in once again. The Baganda should stop running away from Buganda in the hope that somehow miraculously somebody else will develop the land for them to come back to when it begins to flow with milk and honey. Nobody will develop the land for you but yourselves, and this is the greatest challenge that you face. Baganda derived great pride and satisfaction in the payment of taxes in the past. Baganda were very proud of their good manners. Let us rediscover that pride and use it to rebuild Buganda and Uganda. Buganda was built on accomodation and the palaces of the Kabakas were the melting pots of nationalities and talents. Buganda still stands on her record of accomodation but what we ask for is reciprocity. Indeed Uganda would become a very strong and united nation if there was reciprocity all around. Lastly let me make this pledge - the Mutebi reign will be one of reconciliation, unity, peace and development. I thank all the celebrants and all those who have graced this occasion with their presence.